Shortly before noon on July 3, 1778, Colonel Zebulon Butler led about 400 New England militiamen out of their fortified position in the northern Susquehanna Valley to fight enemy British regulars, loyalists, and Indians. The New Englanders supported American independence, but they also had another motive for their military service: they wanted control over the Wyoming Valley, land also claimed by the Iroquois and Delaware Indians allied with the British, and by Pennsylvania. In the fierce engagement that followed, the combined British and Indian force sent the New Englanders into a panicked retreat, but the aftermath was even more gruesome. Celebrating their victory, the Indians tortured, executed, and scalped their many prisoners. By dawn the following morning, "carcasses floated down river, infesting the banks of the Susquehanna." Massacre at Wyoming, by Alonzo Chappel, 1858. The Battle of Wyoming and the ensuing massacre has been called the "surpassing horror of the American Revolution" because of the brutal acts committed by the Iroquois and their Loyalist allies against the Connecticut Yankees who had settled Pennsylvania's Wyoming Valley. Both of these bloody events were part of a larger land dispute among Pennsylvania, Connecticut, and the original Native American inhabitants of this region. Pennsylvania forces were initially successful in the "First Yankee-Pennamite War" of 1769-1771, but Connecticut settlers continued to filter into the Wyoming Valley and periodically engaged in sharp skirmishes with Pennsylvanians. On Christmas Day 1775, the Yankees defeated 600 Pennamites, as the Pennsylvanians were called, at the Battle of Rampart Rocks near present-day West Nanticoke. The loss spurred the Connecticut General Assembly to establish Westmoreland County, which soon grew to 3,000 residents. When the War for American Independence threatened Pennsylvania in the spring of 1776, the Continental Congress appealed to both sides to "join their brethren in America in the common cause of defending their liberty." Westmoreland County immediately raised a militia and two companies for the Connecticut Line of the Continental Army. Some Pennsylvania settlers also favored American independence, but many thought that Britain would favor their claims over the Yankees if they fought for the Redcoats. Similarly, the Iroquois of western New York agreed to fight for the British with the hope of regaining control of the Wyoming Valley. Supported by Major John Butler's British Rangers, Iroquois leaders planned an attack on the Wyoming settlers to reclaim Indian land and disrupt the grain production that supplied the patriot war effort. They allied with displaced Pennsylvania Indians - mostly Delaware - living north of Wyoming. In the late spring of 1778, Colonel Zebulon Butler, a leading Connecticut settler and Continental Army officer, assumed command of the Yankee militiamen protecting the settlement. On July 1, John Butler's force of about 1,000 British troops, loyalist irregulars, and Indians, marched into the Wyoming Valley and seized Yankee forts Wintermoot and Jenkins on the western banks of the Susquehanna River near Wilkes-Barre. 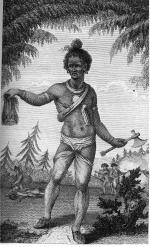 Indian Warrior with Scalp, by Barlow, 1789. The next morning a combined Indian-Loyalist force of 500 marched south and demanded the surrender of Forty Fort. Colonel Zebulon Butler and other senior officers urged caution, debating whether to stay and await reinforcements, or to confront the raiders in the open field. Washington and the Continental Army were en route to New Jersey, so there was little hope for immediate support. The younger militiamen pressed for an attack, until their officers gave in. On July 3, Colonel Zebulon Butler led his militiamen out of Forty Fort to do battle. While marching to attack the British-led invaders at Fort Wintermoot, the troops were spotted by an Indian foraging party. Informed that the Yankees were within a mile of his position, Major John Butler ordered the fort "to be set on fire so that the enemy will be deceived into believing that they had retreated." The British officer then organized his line of battle in the surrounding woods. At approximately 3:00 p.m., Colonel Zebulon Butler and his men arrived at a burning Wintermoot. But the Yankee officer was not fooled. "Come out, ye villainous Tories!" He cried. "Come out and show your heads if ye dare, to the brave Continental Sons of Liberty!" When the opposing forces ignored his demand, Colonel Zebulon Butler ordered an attack. The Yankees fired three volleys with no resistance from the enemy, who were laying low in the forest. When the Yankees came within 100 yards of their position, the Iroquois warriors sprang from the woods. Supported by British and Loyalist firepower, the Indians outflanked the Yankees, who retreated in confusion. 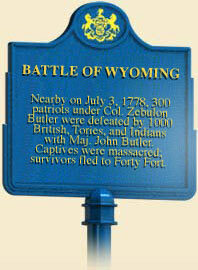 Within thirty minutes, the Battle of Wyoming ended and the "Wyoming Massacre" began. The Iroquois flanking movement had cut off the patriots' retreat to Forty Fort and placed them in a bloody cross-fire. For the rest of the day, Connecticut militiamen were tortured, slain, and in some cases scalped. Many Yankees "plunged themselves into the Susquehanna River with the hope of escaping, only to be pierced with the lances of the Indians." Only sixty militiamen survived. The Iroquois took 227 scalps from the dead, despite the British order to "respect their remains." The Wyoming massacre became an important propaganda tool for the patriot cause, and also forced Washington to appoint Major General John Sullivan to lead a campaign against the Iroquois on the Pennsylvania and New York frontier in 1779. That campaign would force the Iroquois to cede their lands in Pennsylvania and western New York under the second Treaty of Fort Stanwix in 1784. Sullivan's campaign thus secured Pennsylvania's northern frontier, but the Wyoming Valley land dispute between Connecticut and Pennsylvania would linger into the early 1800s. Frederick J. Stefon, "The Wyoming Valley," in Beyond Philadelphia: The American Revolution in the Pennsylvania Hinterland, John B. Frantz and William Pencak, eds. (University Park, PA: Penn State Press, 1998): 144-149. James R. Williamson and Linda A. Fossler, Zebulon Butler: Hero of the Revolutionary Frontier (Westport, CT: Greenwood Press), 1995.